Do you have a fondue pot lurking in your kitchen cupboards? Dust off that puppy — that 1970s dinner party favourite is hip again! Fashion designer Rebecca Minkoff is said to throw legendary fondue parties. Could this retro party idea be trendy yet again? We hope so. The social, interactive nature of a fondue party always helps to get a fun mood going. Plus, it’s minimal prep work for the host. For a cheese fondue, the pot to use is ceramic (you can also use it for chocolate fondue). If, on the other hand, you want to do an oil, wine or broth fondue, you need to use a metal fondue pot. You must keep your fondue warm, not boiling hot. Often a tealight gives enough energy to do the trick. Slice up some French baguette for your classic cheese fondue, but include a vegetable platter as well. Prepare two platters for a table of six people (one for either end), more if you have over six guests at the dinner table (so no one has to reach awkwardly for dippers). Also, to help ensure your guests don’t double dip, cut all veggies and bread into bite-size pieces so that one dip is sufficient and your guest can eat it in one bite. Think about your dinner table shape and seating and how far each guest will have to reach to dip into the melted cheese. 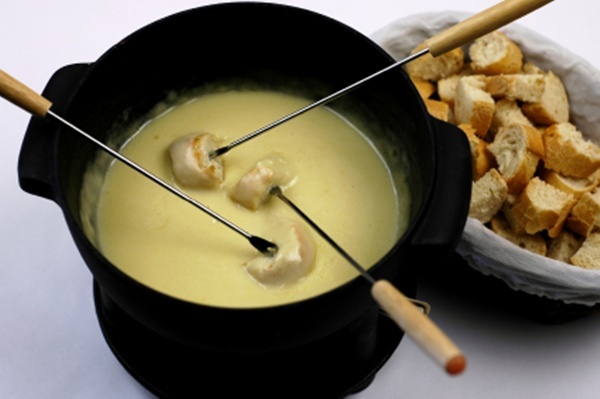 At a typical table of four or six people, guests can reach the fondue pot easily. If your guest list is longer than six people, you’ll likely need to have two or more fondue pots going. Let all guests know that double-dipping is a no-no. And remind them that the cutlery they use to dip into the fondue should differ from the one they eat with. If it’ll be cumbersome to switch from the fondue dipping fork to a different fork for eating, perhaps remind guests to eat their dipped foods without lips or tongue touching the fork, which is going right back into the pot.